Transportation of a car without a single wheel. 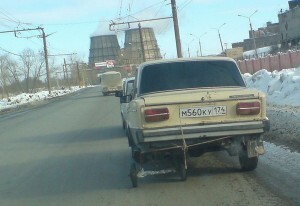 Another option for transporting a car without a rear wheel. Transportation of the car. Visor for the front door of the car's hood Wheel repair on a computer chair Helicopter from the car The off-road vehicle based on the car "Zhiguli"
Summer crafts with children. Drawings, applications on the theme of summer.